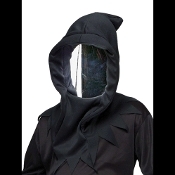 Spooky Black Hooded Mask with a silver mirror in the face opening. You can see out, but people can't see in. Very scary! Creepy Halloween haunted house cosplay costume accessory, ideal for executioner, grim reaper, angel of death, Dungeons and Dragons Master and more! One size fits most adults and teens.